Monaco.. is there a more tempting place to unleash the power of a Ferrari with the roof down? The city is home of the famous F1 Grand Prix and once you drive through those famous street, it's quite challenging not to push the pedal to the metal! 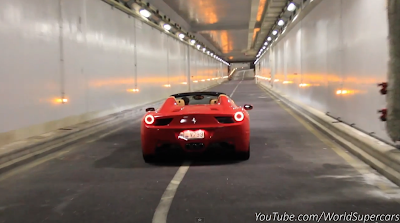 The video of today takes us in the passenger seat of a Ferrari 458 Spider that disturbs the peace of the night in Monaco as it roars around the tunnels and streets. The orchestra of the italian 8 cylinder echoes through the Principality and the absence of the cops in the area is a good reason to attempt multiple accelerations in the tunnels!